Character Renovations Ltd. manufacture windows, doors and conservatories. Character also supply and fit Orangeries and Garden Buildings - the latest home addition trend. We supply and fit in all materials including Upvc, Aluminium and Wood. Character Renovations provide outstanding, quality workmanship, style and value for money in all of the work we do. Character are more than a double glazing company in Chesterfield - we offer complete double glazing repairs and replacement windows and glass. Character Renovations (Character Windows, Chesterfield) are specialists in unique designs for traditional properties, including vertical sliding sash windows. We also offer fascias, cladding, soffits as well as a full range of other building services. We provide both bespoke and standard designs in Upvc, wood and aluminium. In addition to our locally manufactured bespoke conservatories, windows and doors we offer professional building and property renovation services. We also supply and fit bespoke Kitchens and Bathrooms. Let Character Renovations add character and style to your home or business. Our windows, doors and conservatories give you warmth, quality and security. 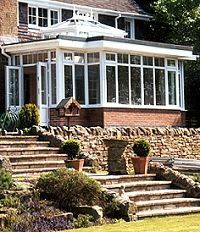 As well as windows, doors and conservatories, Character can also create and install an orangery for you, your family and friends to enjoy. Orangeries are becoming popular with those who wish to invest more into their property. Whether you require new windows or doors, or would like a quote for your new dream conservatory, orangery, or other special project, Character Renovations Ltd. can make your renovation dreams come true! Your Local Window, Door and Conservatory Manufacturer, Supplier and Fitters. Serving Chesterfield Derbyshire, the Peak District as well as surrounding areas and beyond.